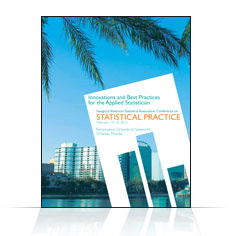 Welcome to the 2012 American Statistical Association Conference on Statistical Practice. Follow the tabs at the top of this page to navigate through the site. Statistical Practice 2012 aims to bring together hundreds of statistical practitioners, including data analysts, researchers and scientists, who engage in the application of statistics to solve real-world problems on a daily basis. The conference will provide an opportunity to learn about the latest statistical methodologies and best practices in statistical design, analysis, programming and consulting. The conference is designed to aid applied statisticians in improving their abilities in consulting with and helping customers and organizations solve real-world problems. Learn statistical techniques that apply to your job as an applied statistician! Learn how to better communicate with customers! Learn how to have a positive impact on your organization! Statistical Practice 2012 will offer full-day and half-day short courses (limited seating), an Opening Plenary Session, concurrent invited paper and contributed poster sessions, a Closing Session, focused and innovative tutorials (limited seating), and exhibits. Comments and suggestions are welcome at meetings@amstat.org. This page is updated frequently, so visit often.